Turn your TP into art with Bertrand Jayr's piece that looks like a cumulus cloud. Still keeping your TP sink side (or on the back of your toilet?) We're about to rain on your parade—in the best, most artful way. French Designer Bertrand Jayr takes an everyday object and turns it into the ultimate stratus symbol. Place one or two rolls in the round grooves of his concrete piece and notice how they look just like a fluffy cumulus cloud. You can also use the smaller groove to prop up your phone, you know, for longer trips to the loo. Made in China. Complete your "cloudy sky" collection with the full-sized companion. Bertrand Jayr is a young artist/designer from Lyon, France, who, strongly influenced by conceptual art, enjoys making objects 'talk'. Love the cloud toilet paper holder! 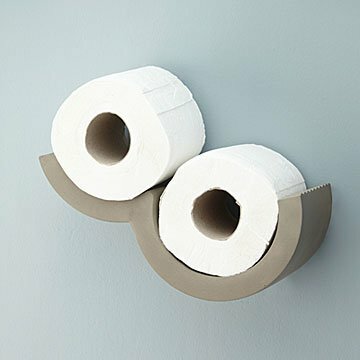 Cute display for toilet paper.